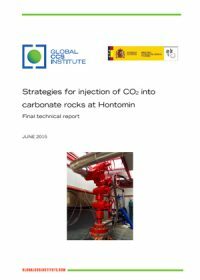 This is a technical report examining the different strategies used for injection of CO2 into Carbonate Rocks at the Hontomin CO2 Storage Project in North West Spain. The report is authored by the CO2 injection team at CIUDEN (or Fundación Ciudad de la Energía – Spain's publicly funded energy research foundation), in collaboration with the Ground Water Hydrology Group of UPC-CSIC Barcelona. The report aims to give an overview of current thinking around CO2, carbonate rocks and their interaction, before going into detailed description of the various CO2 injection strategies employed at the Hontomin test injection site. A summary of the literature on CO2 thermodynamics, and a high level overview of the large volumes of literature on carbonate rocks and their interactions is provided, along with analysis of the performance and interpretation of simulation models and laboratory tests on the dynamics of CO2 injection and storage in carbonate rocks. For each strategy, the shape and size of the CO2 plume and operational conditions for low permeability formations, are analysed. Mechanical stability issues are also discussed. It is hoped that the publication of these results from the Hontomin test injections, will contribute to the development of key site characterization techniques and the improvement of modelling approaches and field scale tests for evaluation of different CO2 injection strategies. This report is published in connection with a further technical report from the CIUDEN team in Hontomin - Hontomin Reservoir characterization tests – and to a suite of bilingual community outreach and education initiatives created and delivered in the communities around the Hontomin site before, during and after construction of the injection site. 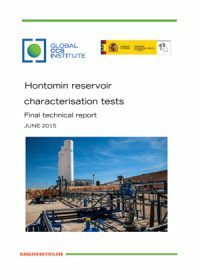 This is a technical report cataloguing the reservoir characterisation techniques emerging from the Hontomin CO2 Storage Project in North West Spain. The report is authored by the CO2 injection team at CIUDEN (or Fundación Ciudad de la Energía - Spain's publicly funded energy research foundation), in collaboration with the Ground Water Hydrology Group of UPC-CSIC Barcelona. Building on existing research into CO2 injection into low permeability carbonates for enhanced oil recovery (CO2 -EOR) operations in North America, the Hontomin site provides an opportunity in Europe to develop injection and CO2 storage-related activities in a low permeability, carbonate deep saline aquifer. This novel approach for dedicated geological storage could provide learnings for potential storage operations in other sites of low permeability. 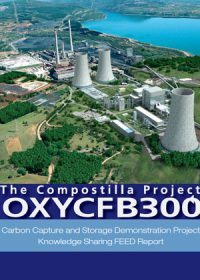 This report is published in connection with a further technical report from the CIUDEN team in Hontomin - Strategies for injection of CO2 into Carbonate Rocks at Hontomin – and to a suite of bilingual community outreach and education initiatives created and delivered in the communities around the Hontomin site before, during and after construction of the injection site.